The Island School lost a great friend and mentor when Fred Danforth died last week after a valiant battle with cancer. Fred’s son Trygg Larsson-Danforth is an Island School graduate of the Fall 2003 semester and Fred’s wife Carlene Larsson served on the Cape Eleuthera Foundation board. Fred and Carlene have been loyal supporters of The Island School since the early years. Fred’s life work celebrates the mission of The Island School, Leadership Effecting Change. Fred C. Danforth, co-founder of Ecosystem Investment Partners, the largest private equity firm in the United States devoted to land and stream restoration, died at his home in Mattapoisett, MA on Thursday after a long fight with gall bladder cancer. An avid fly fisherman, Fred’s passion for environmental restoration began in 2002 when he purchased the Potts Ranch in Montana’s Blackfoot Valley. The ranch contained a severely degraded spring creek that was delivering overheated and nutrient-loaded water to the Blackfoot River. After two years of restoration efforts, trout began to return in prolific numbers, seeking out the cold, clean waters of the restored spring creek. For Fred, gaining the trust and approval of all the project’s stakeholders was as critical to the success of the project as the restoration itself. Realizing that environmental restoration could create economic value, Fred created the Upper Clark Fork Mitigation Bank, the first wetland and stream mitigation bank in Montana. Based on this experience, Fred co-founded Ecosystem Investment Partners in 2006. EIP pioneered a new “ecological asset class” by developing wetland and stream restoration projects in the United States that deliver market returns for investors. EIP has over a half billion dollars under management, making it one of the largest sources of private capital for ecological restoration projects in the world. Born and raised in Brewer, ME, Fred graduated from Yale University in 1973 where he played varsity football. After college, he began his career in finance with Citibank in New York City and left there in 1983 to become president of a regional bank in Tulsa, OK. In 1986, he co-founded Capital Resource Partners, a private equity investment firm located in Boston and retired in 2002 to focus on his projects and partnerships in Montana. A scholarship student himself, the time Fred spent on several Native American reservations, including Ft. Belknap in Montana, led him to endow a scholarship fund at Yale to support Native American students from reservations. A current Danforth scholar is from the Northern Cheyenne Reservation in Montana. Fred is survived by his wife, Carlene Larsson, and two sons, Trygg Larsson Danforth and Pierce Danforth Larsson. A celebration of Fred’s life will be held on April 9th at 5pm at the Boston Harbor Hotel in Boston, MA. 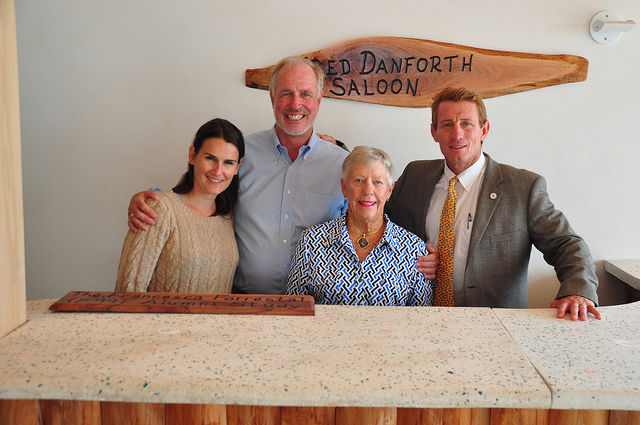 The family requests that in lieu of flowers, donations be made to the Fred C. Danforth ’73 Scholarship Fund at Yale University or the Blackfoot Challenge, a non-profit focused on conserving and enhancing the natural resources in Montana’s Blackfoot Valley. Chris Maxey shares, Fred was a true self made man who loved being a part of a team. You could always lean on Fred to give everything he had in all aspects of his life. We miss him tremendously.